I got my first computer when I was ten years old and promptly spent hours figuring out the inner workings of the machine’s software and hardware. I’ve been hooked on computers and technology ever since. At the same time, I’ve always had a deep drive to make people healthier, and had plans to be a doctor for as long as I can remember. These dual obsessions stayed with me through college, where I majored in Computer Science and Biology at the University of Denver. My grand plan was to combine these two passions and enter a brand new field: digital medicine. I was fascinated by wild new concepts like developing virtual models to test cancer drugs and artificial intelligence. Although a few public health courses and study abroad programs later, I was wrapped up in health policy and systems change and changing my career path, my interest in the intersection between technology and health has never waned. 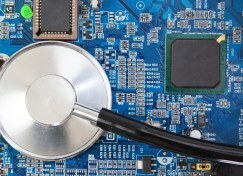 As you might expect, the latest surge in health technology solutions have caught my eye. With the advent of health apps and Fitbits, personal health data is more abundant than ever. Virtual platforms, social media, and the integration of wireless communication in every aspect of our lives, has allowed for new ways to aggregate and present all of this data to providers, patients, and industry experts. And, of course, the Internet is the great democratizer of health information, allowing access to more information, for more people, than ever before. Lately, I’ve been looking more closely at health data visualization and aggregation. Some of these new tools—like maps demonstrating disparities in outcomes—give us a better and more rapid assessment of where to direct our public policy and advocacy efforts. Others—such as Health InfoScape, which allows patients and providers to make associations between different health conditions—provide health care consumers new tools to engage in their own health. These kinds of visualizations have the potential to change our understanding of what makes us healthy and how we can be more effective at reaching our personal and community health goals. Many health leaders and providers I talk to today think health care is on the cusp of a technology boom. The ultimate impact of this technology on how we access and act upon health information has the potential to be quite disruptive to the health care sector, especially in the realm of patient engagement. On September 24, at our Annual Luncheon, Health is Patients, we’re thrilled to welcome Thomas Goetz, a national digital health expert who is finding innovative ways, through technology and data visualization, to better arm patients with the health information they need to make informed decisions. In his popular TEDMED talk, Thomas lays out his vision for making health information more transparent to patients via technology solutions. It’s always been important to us that patients have a voice in health systems change, and we see this as an area that Colorado can do better, and that CCMU can be a leader. We hope you’ll make plans to join us for this important conversation. Health, technology, systems change—with a chance to bring together all my favorite interests, you can bet I’ll be there!